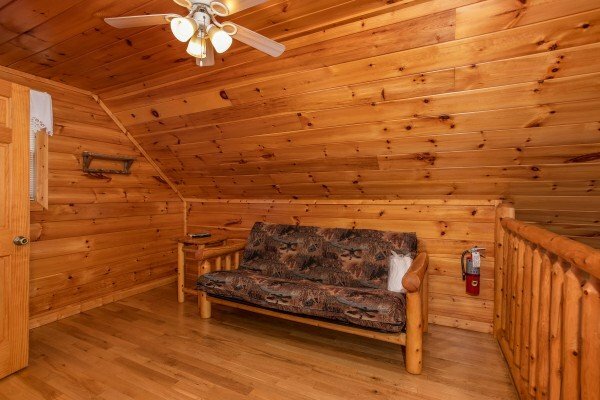 You won't want to leave this wonderful and cozy one luxurious one bedroom, Can't Bear to Leave. 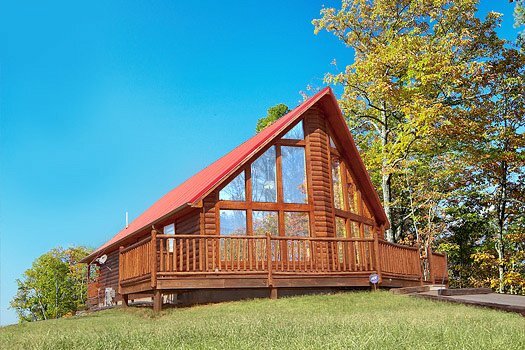 A Log Cabin with everything a honeymooner could want! 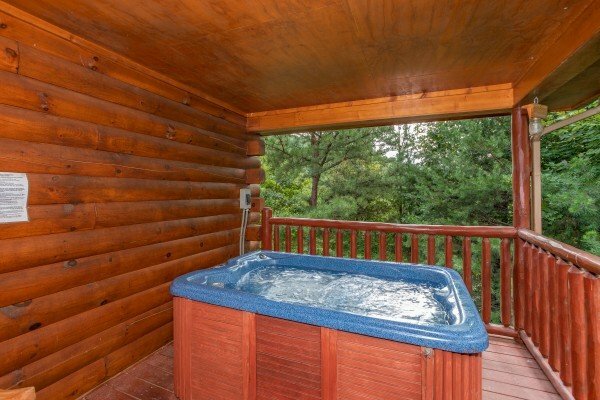 A Romantic King bed next to the heart shaped Jacuzzi tub built for you and that special someone to share some relaxing quiet time or enjoy the outdoor hot tub on the covered back deck. 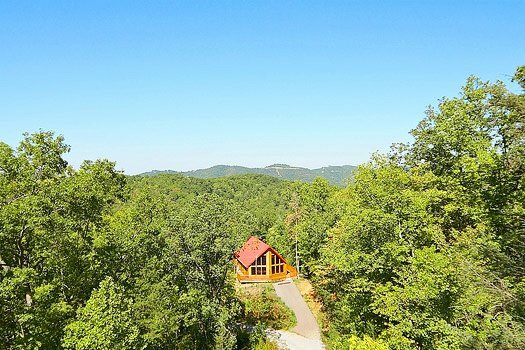 This cabin is just what you are looking for in a romantic hideaway in the mountains of East Tennessee. With a large open living area with 30ft ceilings and a huge wall of glass gives you the openness to enjoy a spacious one bedroom and still feel right at home. 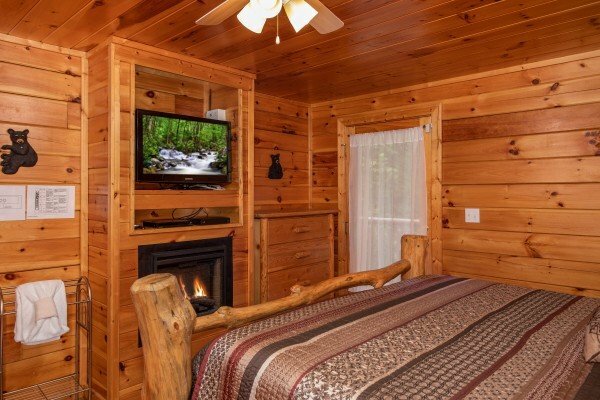 With a electric fireplace in the living as well as at the foot of the king bed will allow you to enjoy the cozy fireplace feeling year round. 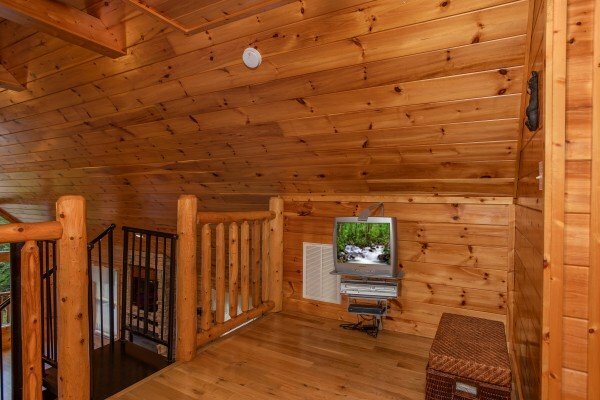 This cabin also boasts, a pool table, 3 TV's with DVD/VCR's and a futon and 1/2 bath in the loft which is accessed by the spiral staircase Bring the family or friends or just you and that special someone, leaving will be unbearable. This was our favorite cabin that we have stayed at through APG thus far. Its comfort ability and secluded area were amazing. The jacuzzi was amazingly comfortable. Overall, it was a fantastic cabin to getaway in. Hot tub wasn't working but was fixed the next day. Overall experience was absolutely wonderful! 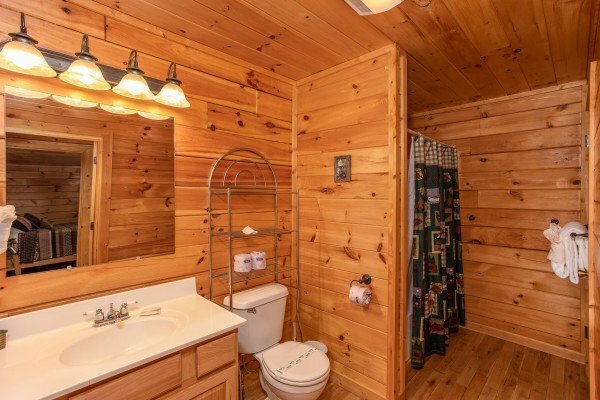 Cabin was wonderful and clean. Might prefer a cabin not so far back in the resort but we loved this cabin. 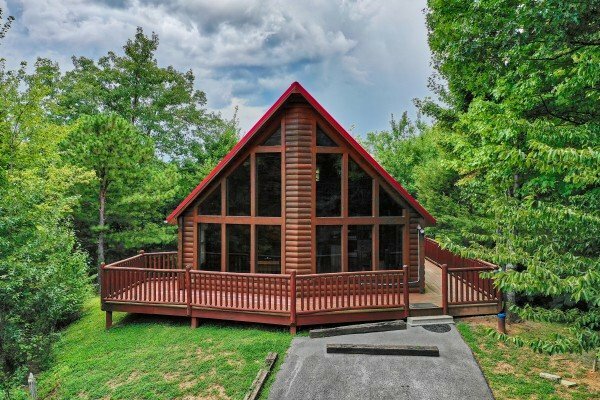 This is a gorgeous cabin! 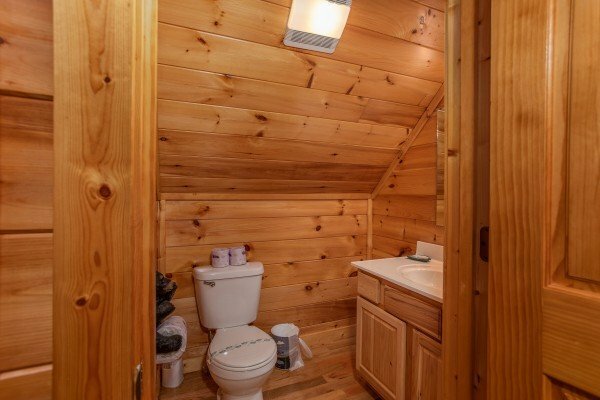 It is very open and just right for a couple--nicely secluded. It was very clean as well :-). The only difficulty was finding it--the roads were tricky. Can't Bear to Leave It was the perfect cabin for our purpose. 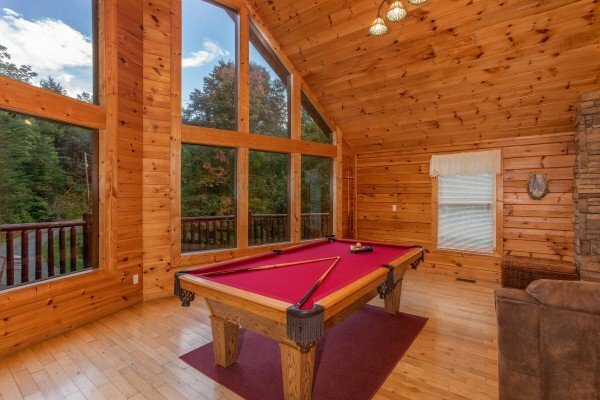 Located in the area between Pigeon Forge and Gatlinburg with easy on/off access for the Parkway made this spot quite convenient. 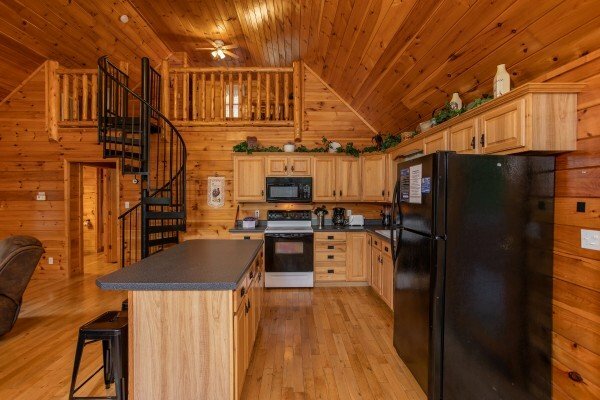 The cabin was incredibly clean with plenty of towels, cooking gear,sheets, etc. 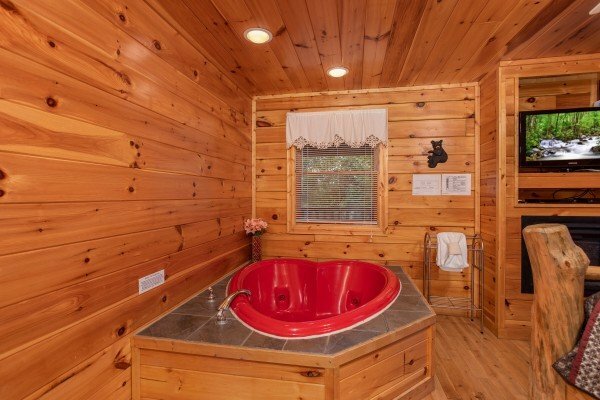 We particularly enjoyed both the jacuzzi and the hot tub. The only two negatives were that the pillows on the master bed could have been of better quality and there was a black ant problem in the kitchen. Nothing is perfect, but this was darn close. One extra that we'd suggest is internet access. Patriot was extremely cooperative with all of our needs including explicit direction that without, could have made finding the cabin a nightmare. Thanks for all of your services. We really needed a carefree vacation and you did your part in providing it. My husband and I came down for our 12th anniversary. It's the first time we had taken a "just us" trip since our first anniversary. We both had a wonderful time!! 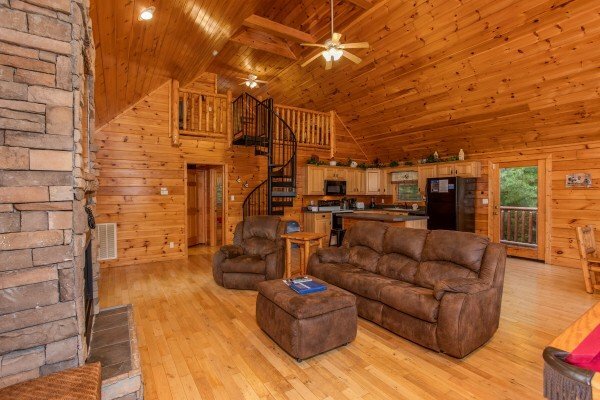 We absolutely loved the cabin! APG is wonderful to deal with. 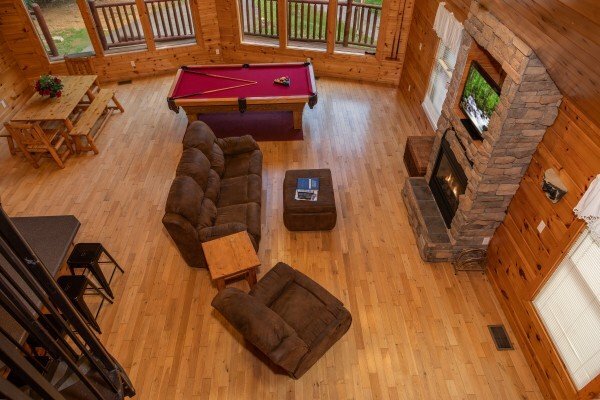 We will be back in May with the whole family in another one of APG's cabins. Love, love, love!! We would stay with APG again if we came to the area. We loved the cabin and would stay in it, or one like it, again. (We may consider staying in one not quite as far back.) We chose this one because it had a small yard and we prefer the one-floor design. Does APG have properties in other states also? 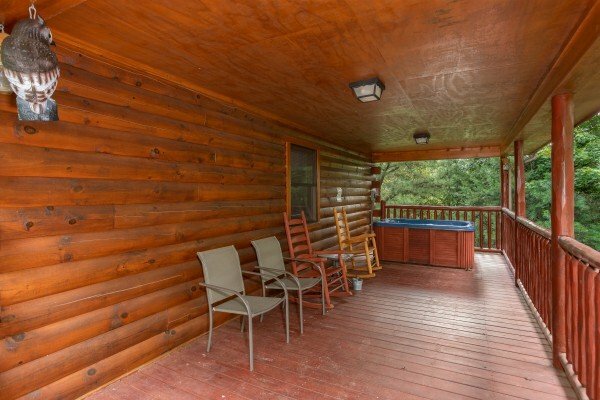 This cabin was great, and it made our trip to the area wonderful. The only small suggestion we would have would be a rod or hanging pegs for a few clothing items!! We especially loved the electric fireplace and open floor plan! The kitchen area in particular exceeded our expectations! Thanks APG ... from when we made our reservation in February, through our stay in July, we appreciated all the excellent customer service and accommodations! We have already recommended you to others interested in a visit to the area! My wife and I spent our 10th anniversary at this cabin and it was everything we expected. 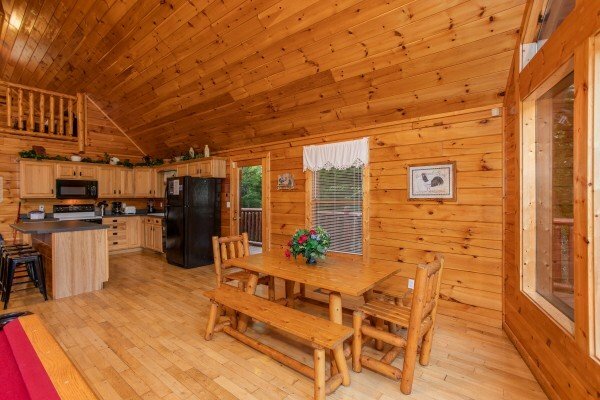 The pictures don't do the cabin justice. It was nicer than expected and extremely clean. 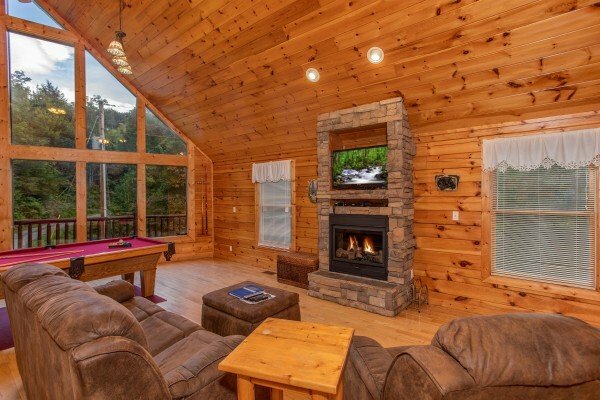 This is why Patriots is the only company we use for Gatlinburg cabins. Thanksfor a great time. ME AND MY WIFE BOTH LOVED THE CABIN, IT WAS VERY CLEAN,SPACIOUS,AND BEAUTIFUL.WE HAVE STAYED IN SEVERAL CABINS OVER THE YEARS AND "CAN'T BEAR TO LEAVE" WAS BY FAR THE BEST CABIN WE HAVE EVER STAYED IN.WE SPENT MOST OF OUR TIME ENJOYING THE HOT TUB ON THE DECK OVERLOOKING THE FOG BLOWING IN AN OUT OF THE VALLEY'S.THIS CABIN WAS IN A VERY SECLUDED PLACE AWAY FROM IT ALL, BUT YET STILL CLOSE ENOUGH TO EVERYTHING.I WOULD DEFINATELY STAY IN IT AGAIN,ACTUALLY I WOULD LIKE TO OWN IT,NOTHING LIKE A CABIN SITTING ONA RIDGE DEEP IN THE WOODS. THE DIRECTIONS TO IT WAS ACCURATE AND SIMPLE TO FOLLOW,IN BAD WEATHER YOU DEFINATELY WOULD NEED A FOUR WHEEL DRIVE TO GET IN AN OUT. Me and my husband had a great time we will definitely stay with APG again, it was a memorable experience. 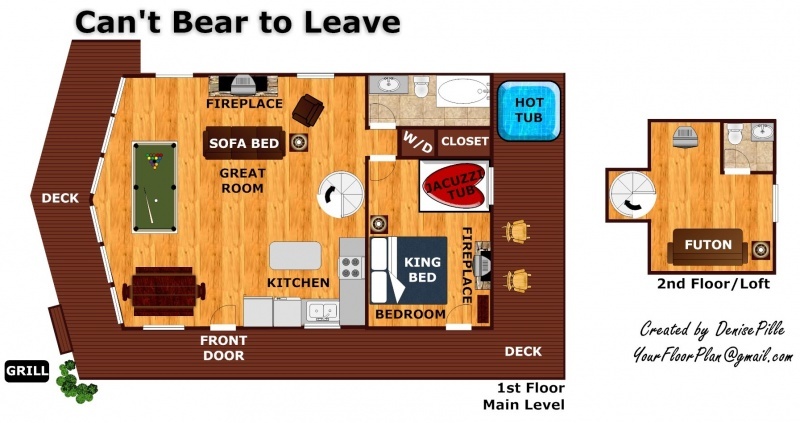 Cant bear to Leave was beautiful and very clean. The only regret we had was that we couldn't stay longer. Signed a definite repeat customer!!! Wonderful experience! 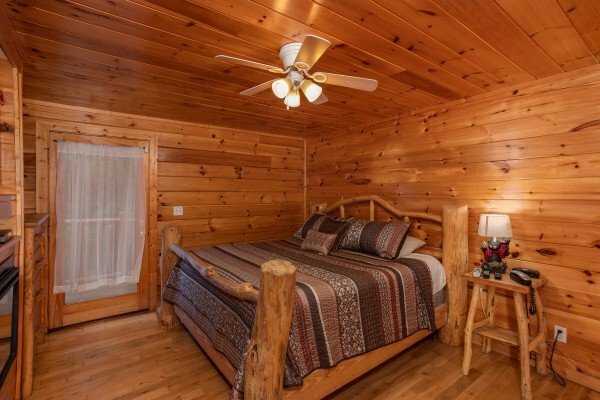 We had never stayed in your cabins before and we LOVED it. Cabin was great- exactly like the picture on the website! We would definitly stay again! We had an awesome time!